The airport, the third busiest in the world, has already been forced to shut three times this year because of unauthorized drone activity, creating a headache for airlines and their passengers. During the most recent closure, which lasted for 90 minutes on Oct. 29, 22 flights had to be diverted to other airports. Each shutdown costs the airport about $1 million a minute. 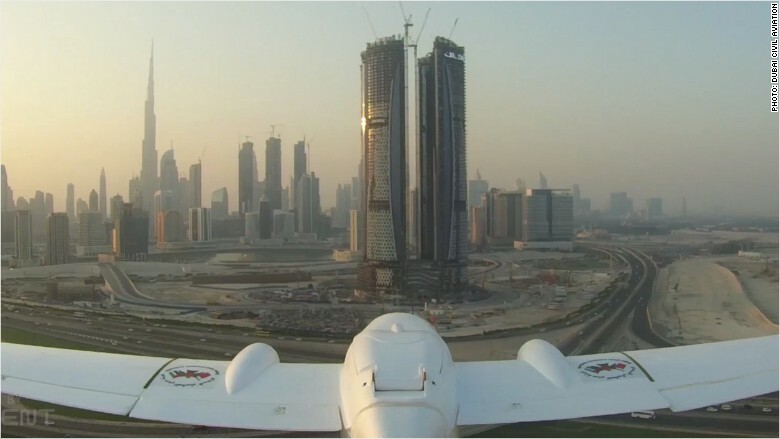 Dubai’s Civil Aviation Authority has responded by testing a ‘drone hunter’ — a remote-controlled aircraft that uses thermal and infrared imaging to detect drones that are in danger of straying into the airport’s space. If the trial deployments prove successful, if could be in use routinely by the end of the year. “It’s a few people that engage in this kind of activity. People want to explore how far their drone can go without realizing they are violating the airspace,” said Salim Al Mansouri, senior aerodrome inspector at the civil aviation authority. “It’s a safety issue and people are losing money because of one person’s irresponsible behavior,” he said. Here’s how the ‘drone hunter’ works: Once it has locked onto a rogue drone, the aircraft follows it back to its owner and sends the coordinates to Dubai police, who then take over. In the Netherlands, authorities have taken a lower-tech approach to tracking drones. Bald eagles have been trained to swoop in and neatly dispose of any electronic interlopers. As more and more drones take to the skies, they are causing ever greater concern for airline safety. In April, a suspected drone slammed into a plane as it approached London’s Heathrow airport. The Airbus A320 landed safely but authorities worry that careless drone use will eventually lead to a catastrophe. The U.S. Federal Aviation Administration says reports of near misses with drones and airplanes have increased dramatically since 2014. In the five months ending January 31, there were 583 such incidents.. They have since introduced new rules for drone users to bring that number down.